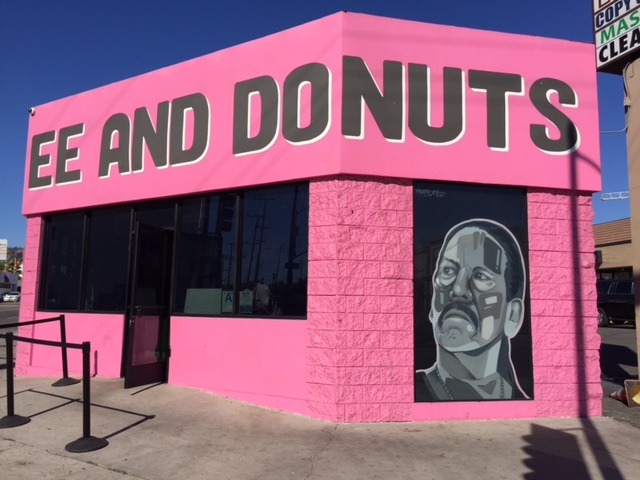 An actor Danny Trejo opened Trejo's Coffee & Donuts on May 17, 2017 in Hollywood, California. First he opened Trejo's Tacos in March, 2016, then now it's the donuts shop, that was just a month before opening Trejo's Cantina. It's on a corner of Santa Monica Boulevard, and it's a small but fully pink shop so that it's easy to spot on. There're other shops in the lot so that there're some shared parking space. They have so many kinds of donuts and those marked with white in the box in front of the names are available. It's mainly a to-go place but there're skinny counter tables by the windows. We got 2; Machete and Old Fashioned. Both weren't big, especially the Old Fashioned was quite small. Buttermilk cake, vanilla, nutmeg, basic glaze. The diameter was about 7cm (2.75 inch). It's flat and maybe 3cm (1.18 inch) or so. Thick layer of glaze was lightly crunchy, and the outside of the donut was crispy while the inside was soft and moist. The glaze was so sweet that I couldn't really tell the sourness of buttermilk in this cake donut, but I noticed sweet vanilla scent. However, I don't like nutmeg or cinnamon that much, and I tasted more nutmeg than vanilla. Filled donut, jam, blubbery, raspberry, dark chocolate, royal icing. I've never seen but my husband said it's from his first lead in a movie called "Machete." It's a shape of knife with blood splash. It's an yeast donut and tall. It had silver coloring for the blade of the knife. Royal icing is made with egg white, powdered sugar and lemon juice, according to my search. The fluffy yeast donut had sour berry jam inside. The filling was much sourer than I thought and it made the dark chocolate even taste sweet. Thanks to that balance, I enjoyed this donut a lot.